ABSTRACT: Work in progress about linearity in early romantic music. The essay discusses non-traditional dissonance treatment in some contrapuntal passages from Schumann’s Kreisleriana, opus 16, and his Grande Sonate F minor, opus 14, in particular some that involve a wedge-shaped linear motion or a rhythmic shift of one line relative to the harmonic progression. The present paper is the first result of a planned project on linearity and other features of person- and period-style in early romantic music. (1) It is limited to Schumann's piano music from the eighteen-thirties and refers to score excerpts drawn exclusively from opus 14 and 16, the Grande Sonate in F minor and the Kreisleriana—the Finale of the former and the first two pieces of the latter. It deals with dissonance in foreground terms only and without reference to expressive connotations. Also, Eusebius, Florestan, E.T.A. Hoffmann, and Herr Kapellmeister Kreisler are kept gently off stage. Schumann favours friction dissonances, especially the minor ninth and the major seventh, and he likes them raw: with little preparation and scant resolution. 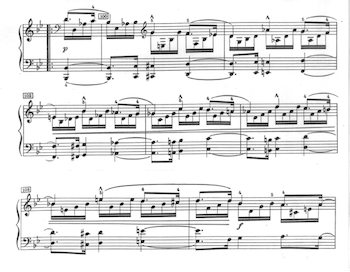 The sforzato clash of C and D in measures 131 and 261 of the Finale of the G minor Sonata, opus 22, offers a brilliant example, a peculiarly compressed dominant arrival just before the return of the main theme in G minor. The minor ninth often occurs exposed at the beginning of a phrase as in the second piece of the Davidsbuendler, opus 6: the opening chord is a V with an appoggiatura 6; as 6 goes to 5, the minor ninth enters together with the fundamental in, respectively, high and low peak registers. Or it occurs at the accented culmination of a fast melodic wave as in measures 136 and 138 of “In der Nacht,” the fifth piece from Fantasiestuecke, opus 12 (an almost identical situation is found in measure 11 of Variation VIII from the Symphonic Etudes, opus 13). There is also the pivot function, as in Number 15 of the Davidsbuendler, where in measures 43ff the C minor leading tone B is held over from the dominant seventh chord, itself equipped with minor ninth, and is intensified as the minor ninth C of the dominant chord of E major. Or the use as opening melodic interval, as in the Scherzo variant of the Clara Wieck theme in opus 14 or the show-off imitative counterpoint in measures 2ff of the first Intermezzo, opus 4. To a great degree Schumann's dissonance treatment is a reflection of contemporary practices. External dissonance—linear components entering simultaneously with and conflicting with the chord—occurs as metric suspension or appoggiatura, submetric appoggiatura, or simply as accented passing note, very often as accented chromatic lower neighbour. Internal dissonance favours the accented passing and neighbour notes, especially the chromatic lower neighbour. 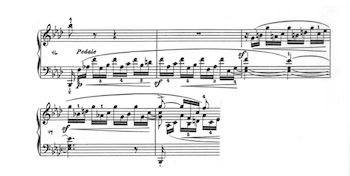 In these situations, however, Schumann characteristically does not work around harsh dissonances but tends to seek them out; typically, resolution notes clash with non-chordal notes. In most cases tempo and textures keep the degree and intensity of dissonance within the bounds of refined spicing that is a distinctive feature of Schumann's piano music. But sometimes the intensity is heightened. This paper looks at three contrapuntal situations where this happens: the linear wedge and two kinds of rhythmic shift. The right hand part of Example 1 (Kreisleriana, opus 16, first movement, measures 1–4) analyses into two chords per measure, each chord built by two triplets. The pattern is enriched by the half step motif that begins the piece and connects each chord with the next. The function of the motif as chordal or non-chordal is ambiguous and subject to interpretation—no particular reading is consistent throughout the phrase. Now imagine the left-hand part pulled back an eighth note so that each of its notes supports the right-hand chord at the strong beat. Apart from the ninth on the first downbeat and the suspension chord at the cadence, linear dissonance is not a propelling force in this configuration. But when the left hand trails by an eighth, as it does in the actual music, the successive dissonances on strong beats: the ninth in measure 1, the seventh and diminished octave in measure 2, push forward more strongly than the harmonic progression alone (note that as harmonic dissonance takes over at the end of measure 2, dissonances on strong beats become less pointed). Thus, the rhythmic shift changes an essentially homophonic passage into a kind of two-part counterpoint, not the classical kind but a counterpoint where one of the two parts is a composite of chordal arpeggios and the left-hand “suspensions” resolve by joining the new chord without concern for interval or direction. In the consequent phrase the left-hand part too becomes chordal and the conflicts become more complex. It could be argued that the performer can reduce complexity by articulating the left-hand part away from the strong beats. But whatever the performer does, the listener is likely to hear what auditory stream theory predicts: two streams where dissonance conflict helps rather than hinders segregation. As in any tonal contrapuntal situation, the dissonances support the independence of the lines and the quasi-imitation brought about by the left-hand syncopation binds the two lines together enough to allow the common harmonic progression to remain intact. In other words, the “reckless counterpoint” caused by the rhythmic shift strengthens stream segregation and thus is a powerful way to reinforce the linear dimension of the harmonic progression. The trailing left hand technique occurs in others of Schumann's piano works from the thirties, for instance in measures 5ff of opus 10:2, but apart from experimentation with rhythmic shift and dissonance clashes in Carnaval, opus 9,(2) the discovery of its potential for forceful dissonance treatment appears to have come with the Kreisleriana. Striking ways of creating conflict between elements of different chords, however, are at the center of attention in the Finale of opus 14 which antedates Kreisleriana by about two years; in the discussion of Examples 6 and 7 we shall see chord and dissonance conflict at the full measure level. Example 2 (Kreisleriana, first movement, measures 24–26) is included to show in the first place the remarkable contrast between the first section of the movement and the second with its downward arpeggios and pedal tones and its absence of chordal conflict even while the motion continues to be carried by the same triplet rhythm. Refined dissonant spice here results from the chords of the harmonic progression shining through a veil of pedal tones, B and F. But the passage also hints at a linear relationship that is exceedingly common in Schumann's piano music. While the upper voice (the slurred sixteenth pairs) makes oblique motion against the pedal, a couple of measures after those shown in the example a descending bass motion develops below the pedal B , the pedal gradually dissolves, and the upper voice maintains its register in short contrary motions against the bass until just before the cadence. The result is a wedge-like motion where one voice functions as a simple or ornamented pedal. Even more pervasive than the oblique wedge is the contrary motion wedge. Every section of the second movement of Kreisleriana offers examples of some kind of wedge, in oblique or contrary motion or a combination of both; one of the most striking wedges begins in measure 17 where three voices engage in contrary motion extending from the interval of a sixth to the distance of a full three octaves, all of this happening over a pedal. In stepwise diatonic contrary motion there is of course always a point where a seventh and a ninth occur in succession (separated by a major or minor second—and thus belonging to interval class 2 or 1 with their difference in dissonance quality—depending on whether or not the octave/unison of the pair occurs on one of the notes of the tritone in a diatonic scale). The strength of the respective lines takes precedence over any resolution rules that may be embedded among the style criteria so that the notes are heard as passing notes. The effect of the successive dissonances then is a sense of momentary friction that adds to the vigour of the passage. 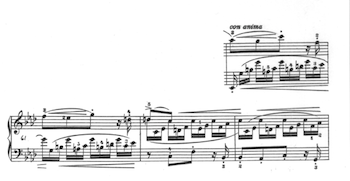 With three voices engaged, Schumann takes advantage of this effect in characteristic ways—and since this example was an afterthought and has not been included as a GIF, I must ask the scoreless reader to imagine the texture. In measure 17 the upper and the lower of the three moving voices make an exchange in stepwise eighth-note motion, the upper voice running from B 4 to G5, the lower from G3 to B 2 within the harmonic framework of a dominant seventh chord built on the pedal tone C. The middle voice runs essentially in parallel tenths with the lower voice but changes register twice: between the first two notes, B 3 to A4, and the last two notes, E4 to D5. At the moment the third and fourth step of the outer scale segments have gone from minor seventh to major ninth, the middle and upper voices reach their seventh and go on to the ninth—in this case the major seventh and the minor ninth. The leap in the inner voice after the ninth weakens the line and makes the dissonance stand out. Despite the brevity of the impression, this clustering of passing dissonances on the way to the culmination of the wedge (added to the vertical coincidence for a short moment of the pedal C3 with D3, E5, and F4) creates an exquisitely calculated contrast to the consonance and mild dissonance of the section as a whole. A chromatic wedge either has two unison/octave points a tritone apart, surrounded by intervals of interval class 2, or has no unison/octave points but instead has successive intervals of interval class 1 at points a tritone apart. The first kind typically occurs in the omnibus progression—and there are numerous examples of omnibus fragments in Schumann's music (the section beginning in measure 119 of the second movement of Kreisleriana uses the same kind of chromatic contraction and expansion as one finds in the omnibus progression). In fact, Schumann avoids the second kind and often also manipulates the diatonic wedge by some chromatic motion so as to avoid the seventh-ninth succession. Example 4 (Kreisleriana, first movement, measures 15–17) shows a wedge with mixed diatonic and chromatic motion in both outer voices where the outer voices avoid interval class 2 dissonance; this, however, finds its way into the progression by a different technique—see below. Clearly, if the upper voice in measure 16 had continued chromatically down over the chromatic bass, the minor tenth would have been followed by a minor ninth and a major seventh, but then one purpose of the wedge would have been lost: to retrieve D minor after a brief excursion into the Neapolitan region. The bass is chromatic for harmonic purposes: it includes the leading tones of IV and V in D minor; the right hand completes the harmonies. The effect is a clarification of harmonic direction as if coming from “somewhere out there” and gradually focusing on the goal. 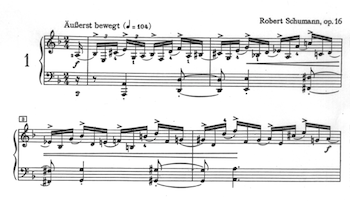 The use of this technique in chromatic harmony would be worth its own investigation; Max Reger, for instance, uses it frequently. Even though the wedge construction in Example 4 itself bypasses sharp dissonances, they are there anyway. In contributing to the harmonic progression, the right-hand part is at odds with the left-hand part in a way that reveals another type of rhythmic shift; for want of a better term let me call it “chordal anticipation.” This technique places a chord, or the better portion of a chord, rhythmically before the beat to which it belongs harmonically. A simple version consists of anticipating the entire chord immediately before playing it on the beat, as at the opening of the first piece of the Davidsbuendler. Rhythmically more elaborate versions tie the right-hand anticipation to the beat and mark the beat by the left hand as in the C major Fantasy, opus 17, second movement, measures 92ff, or tie both hands into chordal syncopation as in measures 84ff of the last movement of the same piece. Variants of chordal anticipation are numerous in Schumann's work, but the most intriguing version from the point of view of dissonance treatment is the one shown in Example 4: one linear strand arpeggiates before the beat and completes the chord on the beat while the other line joins the same chord on the beat. As a consequence, chordal elements are again out of sync so that the arpeggio towards the next beat creates a chordal conflict with the chord established on the current beat. Imagine the right-hand part pushed forward by two sixteenths so that each arpeggio begins on the beat and fills the duration of the beat; then the progression is just a normal harmonic wedge approaching the tonic. Instead, the chordal anticipation technique fills each beat—traditionally the space for the chord supported by the bass line—with chords that more or less contradict both the progression and the expected voice-leading. Obviously, careful articulation and weighting of the arpeggios in performance will guide the listener's understanding of the harmonic progression, but even so, the diminished octave E–E in measure 15 and the minor second G sharp–A in measure 16 will lend a distinctive character of linear dissonance to the whole passage. What goes before the passage shown in Example 4 uses the same triplet rhythm but does not involve chordal anticipation; what follows immediately after it is a recapitulation of the opening material shown in Example 1. Thus, with its chordal anticipation shift the wedge passage mediates between a section without rhythmic shift and the recapitulation of the trailing left hand shift. The two types of shift are closely related and tend to have similar effects on dissonance treatment. As we shall see, things get more intricate when more than one level of harmonic progression is involved. But first let us have a look at a wedge with a different formal function. Using a linear wedge to close a section or prepare a recapitulation is not unusual in Schumann's oeuvre. As an early example, consider the second Intermezzo, opus 4, where the second repeat section prepares both its own return and the return of the initial material in a new key by means of an omnibus-type chromatic wedge prolonging a dominant seventh chord. In the first movement of the Piano Concerto practically every return of the main theme is preceded by some kind of wedge; likewise, in the Finale of the F minor Sonata both returns of the main theme are prepared by a contrary-motion wedge. But wedges are used in a number of different functions, on a smaller scale for voice exchange within a prolonged harmony anywhere in a formal section, on a larger scale for theme construction, as for instance in the Finale of the F sharp minor Sonata, opus 11, where the wedge is one of the main voice-leading techniques throughout. From the dissonance point of view an especially intriguing wedge is shown in Example 5 (Kreisleriana, second movement, measures 100–106—beginning of the second section). Rather than closing a section, it comprises the contrasting middle section of a small ternary form and achieves the unlikely combination of decreasing space and increasing energy. Based on Litzmann's book about Clara Schumann(3), Peter Ostwald quotes Robert Schumann's word to Clara that “there is a thoroughly wild love in some of the movements” of the Kreisleriana(4). Without speculation on expressive connotations (I promised! ), in terms of counterpoint this certainly is one of the wilder moments. Its basic material is given in Example 3 (measures 92f—the beginning of the first section of the same movement). This has some of the character of the trailing left hand but not unambiguously; the harmonies work either way, and the bass appoggiatura in measure 93 of course represents a dissonance treatment Schumann shares with most other romantic composers. The left hand imitates the upper line at the lower fifth in a stepwise descending sequence up to measure 96 but skips every other dotted rhythm. The only real argument in favour of understanding this passage as an example of trailing left hand shift comes on the downbeat of measure 96 where the bass line has reached a C over which the right hand plays a D major arpeggio. Even though the harmonic context suggests the function of the harmony as V , the bass C is simply abandoned for a D and the phrase ends on an emphatically tonicized D major harmony. Abandoning an exposed harmonic dissonance is unproblematic if the left-hand part is understood as trailing the harmonic progression by a beat, but this reading is ambiguous at best. In Example 5 questions of rhythmic shift become entirely irrelevant since here linear progression supersedes harmonic progression during the ascent until D minor is retrieved at the climax in measure 106. The linear framework exhibits rhythmic imitation and quasi-inversional melodic imitation. But the upper line moves up by step from measure to measure so, remarkably, the wedge is shaped by two ascending lines: the upper line moving mostly by whole steps while the lower line catches up by minor thirds (filled in by chromatic motion) and the interval between the two lines becomes gradually narrower. From one accented second beat to the next the interval shrinks from diminished twelfth over diminished eleventh and minor tenth to major ninth; at this point the approach is halted and an exchange of major ninth and minor seventh moves up by whole step to the climax. This indeed is dissonance with little preparation and scant resolution and would be passed off in any traditional text as reckless counterpoint. Dissonance here seems to function at a new and different level: it is not a moment-to-moment event but a gradually increasing intensity over the length of the phrase followed by a gradual decrease (measures 107 and 108 echo the minor ninth appoggiatura from measure 93). Resolution at this level occurs only in measure 110 where the two lines move in parallel octaves down to a recapitulation of the first section. Now, what happens when chordal anticipation in oblique motion is imitated, so that two compound lines create a counterpoint that moves in sequence over a pedal? One of my earliest acquaintances with Schumann was his Grande Sonate in F minor, opus 14, which I stumbled through as a teenager and whose last movement I found terribly boring and in part ugly. A little bit of the “ugly” stuff is shown in Example 6 (Grande Sonate F minor, opus 14, last movement, measures 46–50). The material on which this passage is based comes from measures 9–10 where it follows immediately after the main theme. It is identical to the arpeggio figures in measures 46–47, except that the last two arpeggios in the second measure are C3 G3 E4 and F3 A 3 with F4 on the downbeat of the third measure ending the phrase. In performance it should be articulated as chordal anticipation so as to avoid harmonic confusion at the major seventh leap E4 F3. Yet, the dissonant leap will make its impression and will foreshadow the character of those later sections where this material is used. Taken separately, the two entries in measures 46 and 48 seem to move in E major and C minor, respectively, each ending on a half-measure suspension, although it is only when the third entry comes in on A that the second ending is made dissonant. The effect of the second entry is to change the E harmony into first inversion C minor—unless one is capable of hearing the two strands separately as a bitonal or bichordal progression. The voice-leading B to C in the first two right-hand arpeggios in measure 48 against the left-hand suspension F to E promises a resolution to C minor so strongly that I hear the G-major chord as a large suspension chord rather than as an independent harmony. In either case there is a chordal conflict due to the late arrival of the C minor triad in the right-hand part. It seems then that two rhythmic shifts are at work simultaneously, but at different levels: chordal anticipation at the beat level and the displacement of the expected harmony in the right-hand part at the measure level. The effect of the third entry is to alter the expected F minor harmony so that it functions as part of a B major ninth chord, supported by the large-scale pedal note, B 2. When the two compound parts—the left hand and the right hand—sound together, the amount of dissonance is considerable, but dissonance treatment here stays well within traditional practice. The double-entry progression is sequenced a third up as indicated by the entry on A in measure 50 and again another third up in measure 54 while the pedal B is refreshed regularly. By starting on successively higher scale steps the six entries together unfold a major sixth from F to D, i.e. the fifth and third of the overall prolonged B harmony. When the upper line reaches D6 over the pedal note, the third sequence is curtailed and the line descends, supported by parallel sixth chords, through the dominant seventh note A to resolve by suspension A to G over E at the point where Example 7 begins. In Example 7 (Grande Sonate F minor, last movement, measures 60–63) the chordal conflict extends over not just one but two measures. While the triplet motion now is fragmented and repeated, creating shorter units, the two measures are held together by the eighth-note arpeggio figures that spell out a C minor chord with downbeat appoggiatura dissonance (craftily supported by the “wrong” harmony in the chordal anticipation part). Again the expected E harmony is transformed into first inversion C minor; imitation now takes place in invertible counterpoint a fifth down, spelling out a root position F minor chord; thus, the underlying structure is a 6 5 linear intervallic pattern—not the figured-bass motion where the upper line descends but the “inverted” kind where the bass ascends. This is again sequenced upward and is curtailed when it has reached the E major sixth chord. While in these two passages the counterpoint is perfectly passable as far as dissonance treatment is concerned, it is the harmonic conflicts that make them sound like reckless counterpoint. At this level, then, the sense of heightened dissonance intensity is not so much a question of dissonant intervals as of conflicting chords. By techniques that are bold and advanced for his time, Schumann has achieved a sound that is not only uncharacteristic of early Romantic music but even un-Schumannesque. While I no longer find these progressions ugly but instead exciting and refreshing, their particular sound seems more akin to that of some works in the 20th-century neoclassicist and “neue Sachlichkeit” tradition, the environment where the phrase “reckless counterpoint” was originally coined. This essay has discussed a few style features from Schumann's early piano music and, in particular, different combinations of features. The fact that some combinations occur in a work that stands out as the quintessence of Schumannesque sound, the Kreisleriana, while others contribute to a sound that strikes the listener as peripheral to Schumann's style, brings up a central question that the ongoing project must address: the question of what features a given composer shares with what groups of other composers over what spans of time and within what regions of space, and what features are exclusive to that composer. It also serves as a reminder that questions of style delimitation are highly complex and probably have to do with intricately combined and continuously recombined features of both distant heritage and spontaneous creation. 1. While Schumann’s dissonance treatment is not a new topic, the response “no matches were found” from smt-search to my request for “Schumann and dissonance” served as an encouragement for this analytical caprice. 3. Litzmann, Berthold. 1925. Clara Schumann, Ein Kuenstlerleben. 7th ed. 3 vols. Leipzig: Breitkopf & Haertel. 4. Ostwald Peter. 1985. Schumann, Music and Madness. London: Victor Gollancz Ltd. The quotation is from vol. 1, p. 224 of Litzmann’s book. While Schumann’s dissonance treatment is not a new topic, the response “no matches were found” from smt-search to my request for “Schumann and dissonance” served as an encouragement for this analytical caprice. Litzmann, Berthold. 1925. Clara Schumann, Ein Kuenstlerleben. 7th ed. 3 vols. Leipzig: Breitkopf & Haertel. Ostwald Peter. 1985. Schumann, Music and Madness. London: Victor Gollancz Ltd. The quotation is from vol. 1, p. 224 of Litzmann’s book.